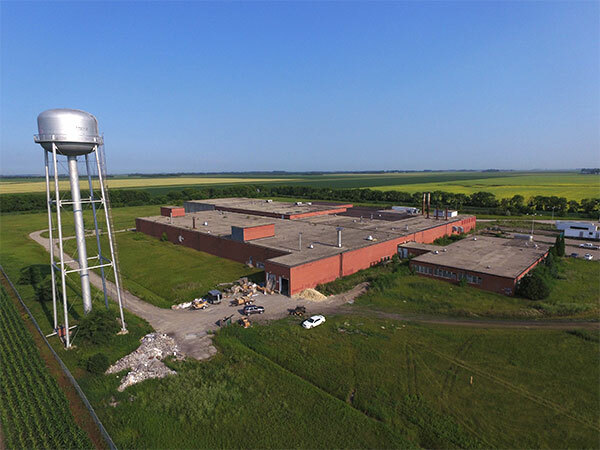 In January 1957, Manitoba premier Douglas L. Campbell announced that the US-based Campbell Soup Company Limited would build a soup manufacturing plant on the west end of Portage la Prairie to supplement its existing plant at Toronto. Construction of the 125,000-square-foot plant, designed by the Winnipeg architectural firm of Green Blankstein Russell and Associates, began in June 1958. 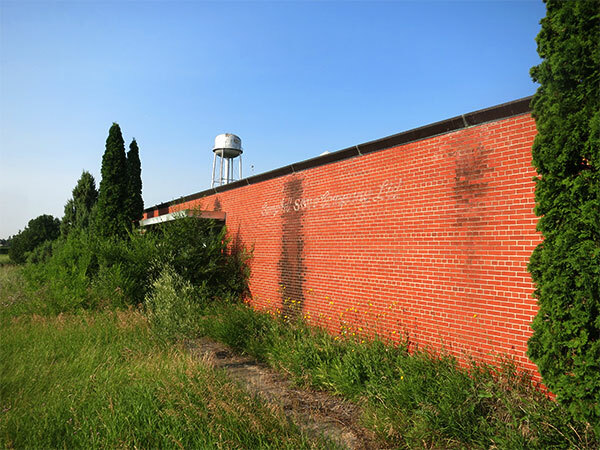 It consisted of five one-storey brick buildings, four of which were used for manufacturing, and a separate one-storey brick building for administrative offices, employee cafeteria, executive dining room, and staff changing rooms. A railway spur to the plant allowed up to five boxcars at a time to be loaded from its warehouse, and a tower on site provided water for the facility. Completed in mid-1960 at a cost of some $5 million, the plant became fully operational by the Fall of 1960, opening officially on 4 October 1960. It employed 170 people to take large quantities of peas, corn, potatoes, celery, onions, mushrooms, parsley, barley, poultry, and beef to produce 17 of the company’s 21 varieties of soup, as well as frozen food products, macaroni and spaghetti. In its first decade of operation, the facility was expanded with a freezer-warehouse in 1964, a mushroom-growing farm in 1966, and a product warehouse in 1968. By the latter year, the plant was making 30 varieties of soup, using 90,000 tons of raw materials annually. In August 1989, the company announced that the plant would close in December 1990, after 30 years of continuous operation, and transfer its production to a much larger plant near Toronto, Ontario. Today, parts of the huge former factory are used for storage by local businesses and private persons, and part is a factory for building materials. The administrative office building is abandoned and overgrown. “Gigantic soup plant will mean cash crops,” Press release, Manitoba Department of Industry and Commerce, 5 January 1957. “Campbells confirm site,” The Manitoba Leader, 14 November 1957, page 21. “Official start at Campbells,” The Manitoba Leader, 5 June 1958, page 1. “Campbells outline plans for Portage,” The Manitoba Leader, 27 November 1958, page 7. “Portage begins to feel the effect of industry,” The Manitoba Leader, 5 May 1960, page 15. “Soup firm opens new Portage plant,” Winnipeg Free Press, 5 October 1960, page 8. History of Portage la Prairie by Annie Collier, 1970, page 272. “Portage losing soup plant,” Winnipeg Free Press, 25 August 1989, page 1. “Campbell plant closing stuns workers,” Winnipeg Free Press, 25 August 1989, page 3. “North American restructuring cited for production cut-backs,” Winnipeg Free Press, 25 August 1989, page 3. “Economic setbacks galvanize Portage,” Winnipeg Free Press, 15 December 1990, page 70.